The Hydroponics Company (ASX: THC) has made agreements to acquire and/or collaborate with several businesses within the medicinal cannabis space. THC intend to become a: leading provider of medicinal cannabis; worldwide manufacturer and distributor of hydroponics equipment, materials and nutrients; designer and constructor of large-scale hydroponic greenhouses. The company is raising $5-8m via IPO, with 25-40m shares issued at 20c each. Investors will be given 1 option for every 2 shares issued through the offer. Leading the offer are Gleneagle Securities and Red Leaf Securities. The non-underwritten offer will open March 16 and is expected to close April 5th. Listing is anticipated April 20. A secondary offer includes 33,450,000 options for founders, directors, seed investors, vendors and promoters. THC will predominantly use capital raised for the purpose of acquiring and developing target businesses involved with the production and distribution of medicinal cannabis and hydroponic equipment. Funds have also been allocated to developing ancillary products and equipment, working capital, and other surplus costs. In the event THC raises $8m, $1m has been set aside for further acquisitions. After finalising the IPO, THC’s market cap will be $16.48m-19.48m. Upon listing, free float will be between 30.34% and 41.07%. At the time of the prospectus, 35.4m shares were issued – 7m for a nominal consideration and 28.4m issued at 5c. While the shares of substantial holders may be subject to escrow for up to 2 years, other escrow arrangements are currently unavailable. 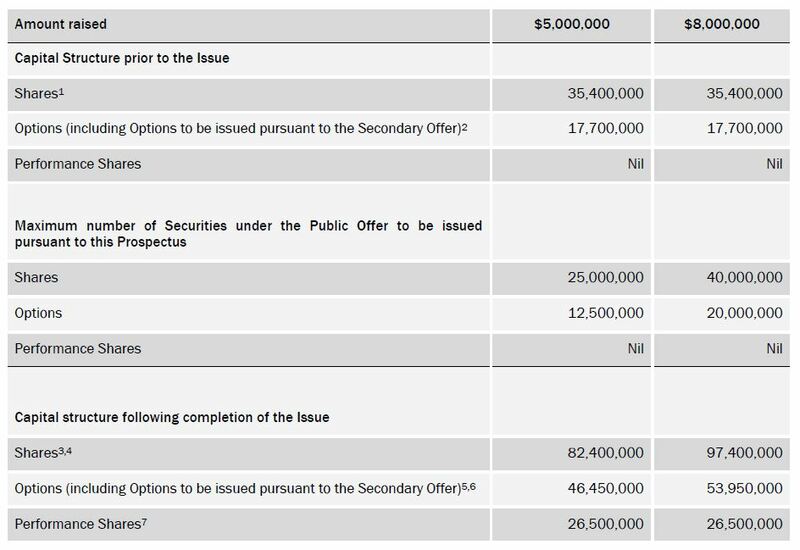 Options issued will be listed on the ASX and may be exercised at a price of 40c until December 31 2019. 26.5m performance shares are being issued to various parties.